I interviewed many kitchen design companies before deciding on Murphy Design. That was the best decision that I have made in a long time. With Cindy's patience and expertise, we came up with a design that was exactly what I wanted, exactly the place that I wanted to spend a good portion of my retirement. John and Andrew are perfectionists which is exactly what is needed for this project. I enlarged the existing kitchen by 50 percent. This meant that everything had to be demolished..... the walls, the floor, the ceiling. They started from scratch. Although there were some "painful" times with dust, no water etc, I had total confidence in John and Andrew. Everyday I am now enjoying the fruits of their labor. I would not hesitate to recommend the Murphy Design company to anyone. 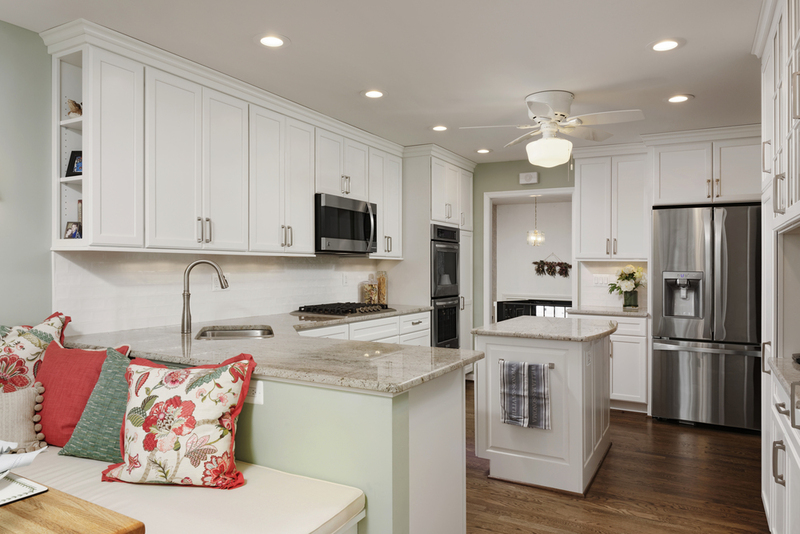 After receiving several estimates for our kitchen project we chose Murphy's designs because they spent so much time talking to us about choices and ideas before we even committed. I loved Cindy's ideas and her ability to be so patient with me while I made up my mind! I valued her trained professional eye for helping me sort through so many choices! Everything about the process was great. Andrew mainly did the demolition and he was very prompt and courteous every morning, and kept the mess to a minimum. I had no problems with dirt and dust all over the house! John is a true craftsman and he did most of the installation, as well as custom built a bench seat under a window and made custom trim for the island and made everything look wonderful. The overall process was fun and exciting and we love our new kitchen! I would highly recommend Murphy's designs. Remodel of family room, laundry room and bonus room; refurbish furnace room. Murphy Design did a superb job beautifully transforming 3 rooms into appealing and functional spaces that we are enjoying and that will add significant value to our home. They are very easy to work with, communicate well and work as partners with their clients to arrive at the best solution. The remodel required us to move/dispose of much that had accumulated over the years but Murphy Design accommodated us with a workable schedule that expeditiously completed the work in stages. The designs were creative and the carpentry and other work was flawless. The trades that they work with were excellent. All in all a very satisfying experience warranting the highest rating. Cindy and her husband John worked with us patiently for a year to come up with an affordable and efficient design for our almost 30 year old kitchen and foyer. The kitchen was gutted and all cabinetry, appliances, lighting, and countertops were replaced and reconfigured. The entry way was updated with new doors, hardware, and lighting and the original tile floor was replaced throughout with hardwood. The powder room was also refreshed. They were wonderful at being very budget aware without sacrificing quality, function, and the overall aesthetic. Cindy was so fun and accommodating to work with. She has such wonderful vision and is so open to different ideas and making sure they are going to work and stay within budget. The Murphy's Design crew was absolutely wonderful. Andrew was on the job site every single day - always on time and left it clean and with clear communication about what was going to happen the next day and in the coming weeks. Their work is meticulous and the people they work with on a regular basis who do flooring, plumbing, electrical, and tile were all outstanding. We were very comfortable having each one of them in our home, even when we were not able to be there. We have a couple of other projects we are looking forward to working with Murphy's Design on and we would not hesitate to recommend them to anyone who needs remodeling or construction work done. From June to September 2014, Murphy's Designs completed a full kitchen renovation for us, to include the removal of two walls and hardwood flooring installation throughout entire first floor of our home. Job was completed within specified timeline, within budget and at a very high quality of work. We could not be happier with the result and would strongly recommend this company to others. Communication was easy, the job site was cleaned up at the end of each work day and the sub-contractors (floors, electric, plumbing) were very professional and thorough. I had a master bathroom completely redone and a significant update to a second bathroom done at the same time. Cindy is an excellent designer. She really knows the products available and provided great advice thorough out the design and construction phases. John, her husband and contractor, does outstanding work. Cindy, John and their team pay great attention to detail with a top quality result. Cindy and John did a great job coordinating the construction phase for two simultaneous projects. It went very smoothly. Cindy was always accessible and checked in regularly thorough out the process. I am very pleased with the final results and would definitely hire them again. As an architectural photographer I find working with Cynthia a completely satisfying experience. Not only is their design and construction first class, their preparation for our photo shoots is as good as we've experienced. For us, being on time, having the site prepared and always willing to share in the creative process makes our job enjoyable. I'm sure they are the same with their clients. Our project involved a complete renovation of our kitchen, removing the wall between the dining room and kitchen, installing hardwood in the kitchen, refinishing the hardwood floors and painting the entire first floor, enhancing and tiling the den fireplace, and installing recessed lighting in the kitchen, dining area and den. We could not be happier with the work performed by Cindy and John Murphy and their team. Everyone on their team was professional, respectful and highly skilled in their specialty. Cindy and John took great care to ensure we were satisfied with every aspect of our project. We highly recommend Murphy Design for kitchen and bathroom remodeling. I had the master bathroom redone in my house. The house is 38 years old, and the master bath was outdated, poorly configured, and had cabinets and fixtures which were old, worn, and not in good shape. The contractor reconfigured the prior master bath, which had two rooms (large area with vanity, shower, sauna, tub and toilet) plus a separate room with another vanity and a bidet which was not used. The wall between rooms was removed, the tub was relocated under a window looking out the back toward the lake, and the wall between the bathroom and master bedroom was removed and rebuilt so that there are two doors from the master bath, instead of the original three doors. The contractor was very efficient, always very clean (cleaned up the space daily prior to departure), and a pleasure to work with. They worked with me for various selections of materials, colors and options. Everyone that has seen the new bathroom is absolutely amazed at how beautiful it looks. I highly recommend Murphy Design, and have already passed their contact information to others looking to redo bathrooms. Cynthia is the consummate professional. She brings energy and enthusiasm to the design process and was very patient; advising us of the relevant details during both the design and implementation phases, which for us were two bathrooms at the same time. Cynthia would check in with us during the construction phase and was easily accessible whenever questions arose. 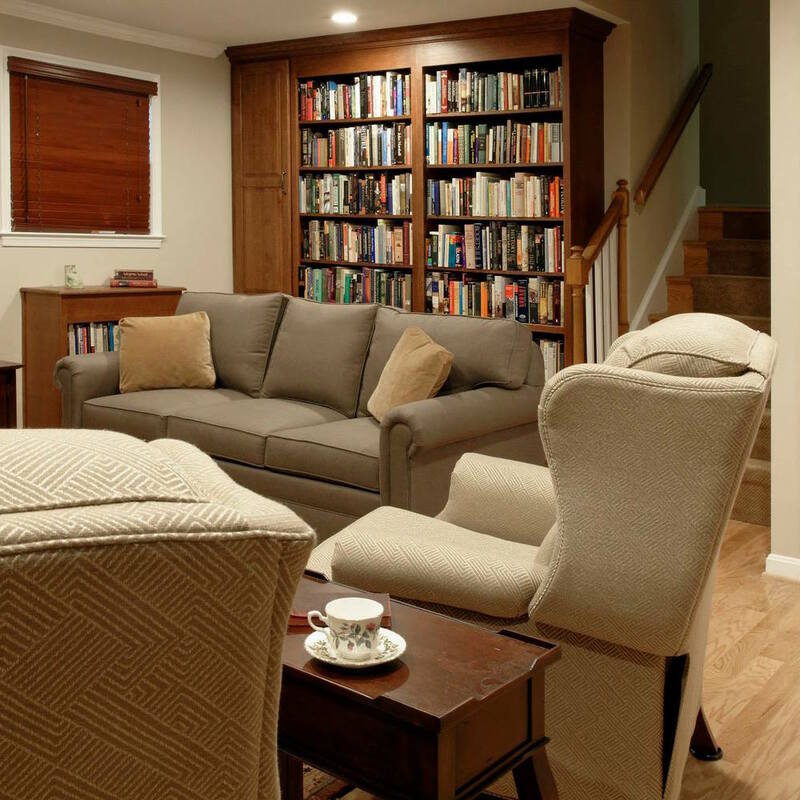 We greatly appreciated her explanations of the pros and cons of our decisions, helping us not to become overwhelmed at the numerous details involved with total remodeling. We felt that she always carefully weighed our preferences and choices and worked to ensure we stayed within budget. The results exceeded our expectations and we thank Cynthia for her enthusiastic support. Cynthia Murphy did an excellent job translating our vision into a finished master bath that we love. We began with a picture, and she walked us through every aspect of the design, suggesting options so that we weren't too overwhelmed with detail but were still able to make the final choices to suit our tastes. She was very knowledgeable about available products. We were provided with detailed drawings and plans. The construction process went well, with a very fine attention to detail and a project manager on site the entire time. There were no unpleasant surprises, and the one time there was an issue with a subcontractor on a glass shower door, Cynthia handled it and the work was redone until it was perfect. She provided a calendar showing the planned progress of the bath project, and by and large met the deadline. We are currently in the midst of our Kitchen Re-Invention. We began the process from afar and stayed in close touch with Cindy and her team. It is a family owned operation and their attention to detail has been greatly appreciated and we are excited for the finished product. Cindy is an excellent designer. Her ideas and selections are top notch. She was very willing to work with me, both in reassuring me when I had doubts and in making changes if I so desired. Her husband and contractor, John, does excellent work, paying great attention to detail. I was also happy with most of the work of their sub-contractors. With a couple of minor exceptions, the only problem I had with Murphy's Design was keeping on schedule, but I would (and did) hire them again to remodel another bathroom. Cindy is the ultimate professional. The years of experience with kitchen and bath design show is every project. She enjoys working with clients and is very patient when changes occur. Cindy is willing to brain storm to find the best option for a particular project. When there is an issue, she is responsive and follow through is complete.